Porto Alegre is the capital and largest city in the Brazilianstate of Rio Grande do Sul. Porto Alegre is one of the top cultural, political and economic centers of Brazil. 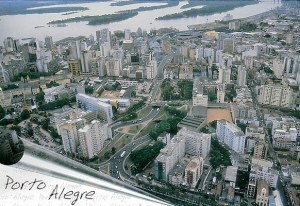 Porto Alegre was founded in 1772 by immigrants from the Azores, Portugal. In the late 19th century the city received many immigrants from other parts of the world, particularly Germany, Italy, and Poland. The vast majority of the population is of Europeandescent.